I'm posting a couple more photos of the unidentified bird from my previous post to see if it helps anyone in their identification of the species. One commenter suggested that it perhaps could have been a black-throated gray warbler. I'm no expert so I could not completely discard this possibility, but the images online for the warbler show more distinct black and white patterns than the bird in my photo, which is mostly gray with the only visible patter being the blue and white streaks by the eyes. Welcome more comments/ideas. If you have any guesses as to what species of bird is perched on the cholla cactus in the picture below, feel free to leave a comment. I got a picture of it from a distance, but I'm not sure what species of bird I captured in the photo. 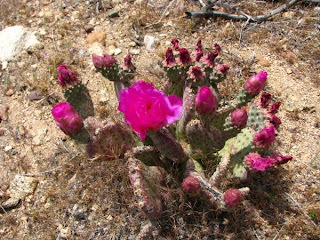 The photo was taken in the western Mojave National Preserve. Note the streaks of blue and white by its eyes. According to the Draft Environmental Impact Statement for the Granite Mountain Wind Energy project, part of the project's footprint and the access roads would interfere with the Bendire's Thrasher Area of Critical Environmental Concern (ACEC). The Granite Mountain Wind Energy Project is being proposed for the hills on the outskirts of Apple Valley by Granite Wind LLC. The Bendire's Thrasher is a threatened species deemed by ornithologists to be so rare that it is difficult to properly assess its recent population trends, although sufficient data suggests that the population has declined approximately 34% since 1966. The bird's habitat is threatened by urbanization, loss of Joshua Trees, and Off-highway vehicle use resulting in habitat degradation. Solar Millennium presented the results of a study that it presumably funded regarding the desert tortoise population on the proposed site of the Ridgecrest Solar Power project. 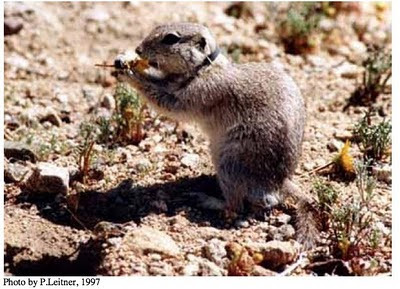 As noted in previous posts, the California Energy Commission (CEC) staff judged that construction on the proposed site would incur harm to the threatened Mohave Ground Squirrel and endangered desert tortoise that could not be corrected by mitigation efforts, and recommended against the project. Solar Millenium's study, however, supports its desire to build on the site and argues that the tortoise population present on the site is not worth preserving. 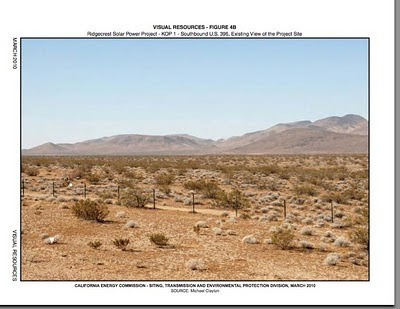 Despite an array of potentially disastrous impacts on Mojave Desert species, water resources for the community of Ridgecrest, and even the risk of spreading Valley Fever among residents, Solar Millennium LLC appears intent to build the proposed Ridgecrest Solar Power project. During a 17 May status conference, Solar Millennium demanded clarity from the CEC and wildlife agencies on specifically what mitigation measures could be instituted to overcome the biological impacts. I previously posted on the Ridgecrest project in March after the California Energy Commission (CEC) issued a preliminary assessment recommending against construction on the site, claiming that no mitigation measures--habitat restoration, translocation of tortoises, etc--would adequately make up for the damage Solar Millennium would incur on our natural resources. What Next for the California Desert Protection Act? The mid-May Senate hearing for the California Desert Protection Act of 2010 (CDPA 2010 or S.2921) was a positive step for the legislation proposed by Senator Feinstein, considering most proposed legislation never makes it beyond the committee. However, the hearings revealed technical objections from government agencies and some deeper concerns expressed by fellow Senators on the Senate Committee for Energy and Natural Resources. As noted in a previous post, the legislative calendar and political dynamics outside of California could eclipse the need for near-term sensible land management in the Mojave Desert, and CDPA may not even get the attention it deserves until next year. 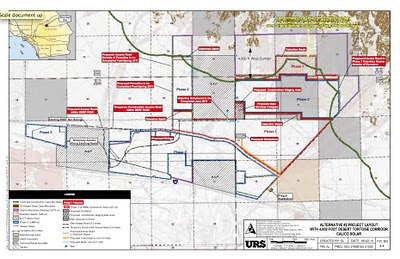 Someone recently commented on a blog post regarding the impact of wind energy on bats that the comment period for the Granite Wind Energy project proposed for the Apple Valley/Barstow area will close on 01 July. I have been meaning to catch up with the wind energy projects in the Mojave Desert and should have a post on this soon, but I wanted to share this in the meantime. Tessera Solar and Stirling Energy Systems, the companies proposing to build the Calico Solar Power project in the Mojave Desert, filed details on an alternative layout for the site with the California Energy Commission (CEC). 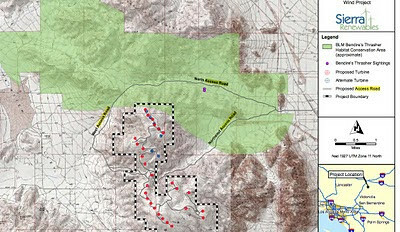 Although the companies claim that the reduced site footprint provides a 4000 foot wildlife corridor between the solar project and the Cady Mountains to allow desert tortoise and other species passage through the area, the maps presented in the documents filed with the CEC suggest that the layout falls short of this goal. I got these shots of cholla cactus near the Granite Hills in the Mojave National Preserve practically glowing as the sun set, which provided a back light to their needles. San Bernardino County Opposes Desert Conservation? The San Bernardino County Land Use Services Department recently filed their response to the Draft Environmental Impact Statement for the proposed Calico Solar Project, located east of Newberry Springs. If I am reading it correctly, the County explicitly opposes long-term conservation of Mojave Desert habitat as a means to off-set the negative impacts of industrial scale development. My brother Todd took some photos during a recent bike ride in the desert around Hesperia. The rains this year seem to have prolonged a colorful Mojave landscape. Calico Solar Site to Be Altered? 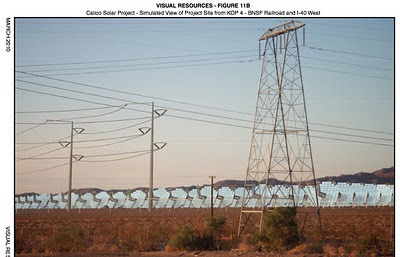 According to the Daily Press, the Calico Solar Project originally proposed for nearly 8,230 acres east of Newberry Springs at the foot of the Cady Mountains will be altered to reduce its footprint. I have not yet found any documentation for the altered proposal at the California Energy Commission (CEC) or the Tessera Solar (the parent company) website, but I will post details from the primary source as soon as they become available. The Calico Solar proposed site would be reduced by 2,000 acres in order to avoid land designated as Desert Tortoise Recovery Area, and the altered site would supposedly maintain a wildlife corridor. According to the Draft Environmental Impact Statement for the project--released by the CEC in March--the Calico site is home to at least one hundred desert tortoises. The altered footprint may spare some of those tortoises, but the site also is home to several other status species, which you can read about in my previous post on the topic. Reviewing the transcripts from the 20 May Senate hearing on the California Desert Protection Act of 2010 (CDPA 2010 or S.2921), the Ranking Member of the Senate Committee on Energy and Natural Resource's opening comments struck me as ill-informed, and as knee-jerk opposition that assumes the effort to protect public land is somehow more reckless than the chaotic "gold rush" effort by energy companies to bulldoze pristine Mojave wilderness. In her comments, Senator Murkowski (R-AK) stated that the proposed legislation would "encumber" renewable energy development and take land off the table before the government had a chance to determine whether or not it would be suitable for renewable energy development.